Thank you for all you do for Wake Forest. Follow these simple steps to make a gift that will create, educate, and inspire. To give to more than one fund, enter the gift information for your first fund and click +. 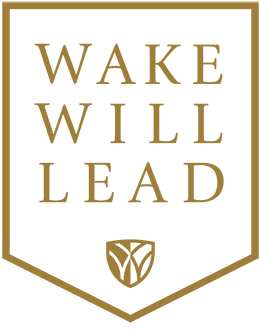 The Wake Forest Fund -- Charlotte Business -- College -- Graduate School of Arts and Sciences -- School of Business -- School of Divinity -- School of Law -- School of Medicine -- Student Aid -- Z. Smith Reynolds Library The Deacon Club Reynolda House I would like to specify a different fund/department. This gift is a tribute in honor or memory of someone. Please provide the information for the tributee. I'd like to send a notification to someone about this tribute. Please provide the information for the person to notify. Check any that are applicable. This gift is a pledge payment. This gift is for The Class Reunion Campaign. This gift is for The Parents' Campaign. This gift is eligible to be matched. Please provide name of the company. Please provide the information for your spouse/partner. I want to include a note for the gift processor. Want to give by mail, phone, transfer or other methods? Find information here.